Last week Skype released Skype 5.11 for Windows – beta and Skype 5.11 for Mac – beta. And the key word here is “beta”. But it starts to give a picture of how Microsoft intends to integrate Skype into its offerings, especially as Microsoft approaches the launch later this year of Windows 8, Office 2013 and various cloud-based offerings such as Microsoft Messenger and Outlook.com (replacing Hotmail). But at the same time I am encountering issues that the beta exposes and hopefully Skype/Microsoft will address in future releases. 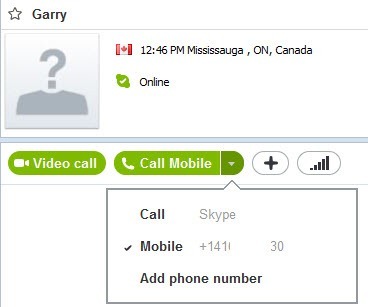 Skype 6.0 for Windows/Mac is the “release” version of Skype 5.11 for Windows/Mac with essentially the same feature enhancements as described in this post. In Experience Skype to the Max I talk briefly about how Facebook integration with Skype operates as two independent chat, voice and video conversation channels with presence. 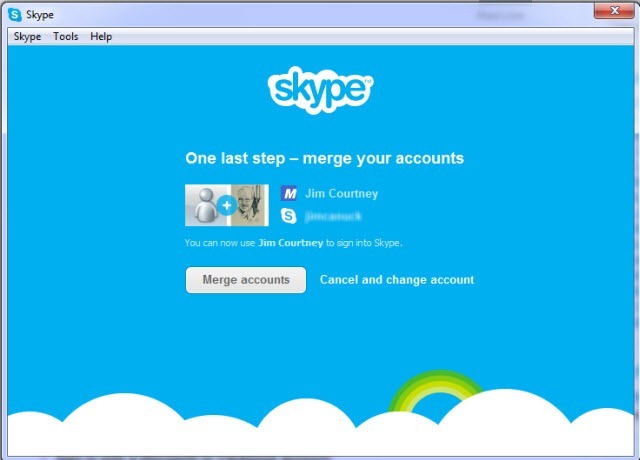 Microsoft and Skype have taken on a much bigger challenge adding Microsoft account linkage and activity into the mix. My initial observations are the result of some experimentation with the Microsoft and Facebook account integration features of Skype 5.11 beta. I come away with the feeling I have one arm tied behind my back because my long standing Microsoft account is associated with Microsoft Canada as I don’t see all the results that others in, say, the U.S. are reporting. • Sharing Instant Messages with friends on Messenger. 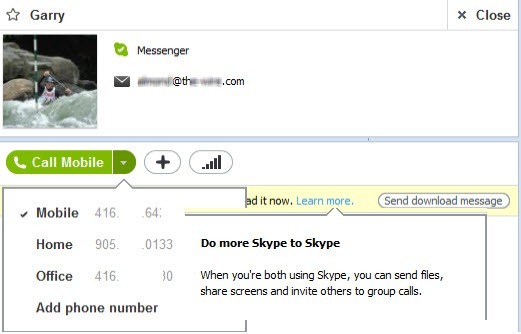 • Link Microsoft and Facebook accounts to a Skype account. To see the new features it was necessary to sign out of my Skype account and log in via either my Microsoft account or Facebook account. 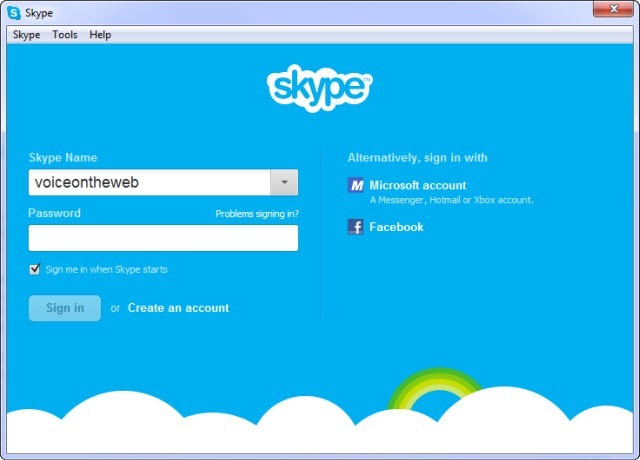 Login via Skype account: you see and communicate with your Skype and Facebook contacts (as has been available in previous 5.x versions of Skype for Windows/Mac). 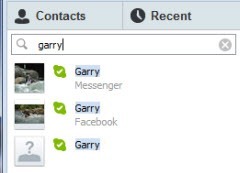 When logged in via a Microsoft account you see and communicate with your Skype, Facebook and Messenger contacts. I also opened Messenger to see if these also showed up as Contacts with their presence status in Messenger. Let’s leave it that the criteria for determining whether a known Messenger contact shows up in the Skype client is not clear; in my case a couple are missing in the Skype client. The issue appears to relate to whether a contact also shows up as a Facebook contact and is associating the same email address with each. However, from the Skype client only chat conversations with Messenger contacts are available; no voice or video. Logging in via Facebook gave me access to my Skype and Facebook contacts. While it showed Messenger as an option in the Contacts | Contact List menus, none of my Messenger contacts showed up in the Contacts tab. does Messenger infrastructure need to incorporate the Skype engine as done with Facebook? not only from the “Learn more” link but also from the “+” sign in the main conversation bar. 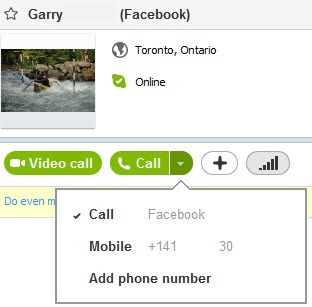 Note that, in addition to chat with any Facebook chat client, free Skype to Facebook video and voice calls are available; in addition a SkypeOut call can be made to his mobile phone number registered on his Facebook profile using Skype credit or a Skype calling plan. 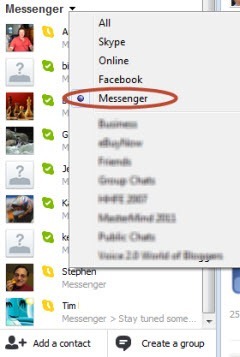 A “receiving” Facebook chat client can be on a PC, a smartphone or tablet (including BlackBerry Playbook). Note that these are the normal conversation options for Skype-to-Skype and Skype-to-PSTN calls. Chat is with the other party’s Skype client on any device supporting Skype chat. This is definitely beta where Skype wants to see how users take up the option to integrate with Facebook and Microsoft accounts, and what conversation patterns result. Other factors to consider include email addresses associated with each type of account and even the registered phone numbers. As the only way to access Messenger contacts is via the Microsoft account login, are we going to see our Microsoft login promoted as the primary or default login to Skype? What will be the fate of the Skype login approach? Once a Skype ID and Microsoft ID are linked can the link be broken/removed? How does the linkage work when a user has multiple Skype accounts? For instance I have linked my primary Skype account; can there also be linkage to my account used for testing purposes? From my side, do I want to link more than one account? Can the chat text entry window changes be reversed as requested in this thread on the forums? Users have enough difficulty with chat activity when it is not obvious (such as realizing that there is access to chat while in a voice or video call). Was this beta only optimized for use with U.S. Microsoft account holders? I am seeing statements confirming integration with Outlook.com and Microsoft People that have not been available to me. In particular it seems the integration of Skype as a “linked account” under Microsoft account settings/permissions appears not to be available to users outside the U.S.
what is the navigation flow that best suits users for launching and sustaining communications activity? what will be the Skype adoption rate when Skype can be accessed via these other account options? retaining the ease-of-use that has always driven Skype adoption. what will be the options for multi-account Skype clients on mobile devices such as smartphones and tablets? Microsoft needs to establish itself as a major player in a social networking world attached to the “cloud” with multiple communications options. The changes for Skype’s clients and infrastructure will be an ongoing work-in-progress over the next few months contributing to that effort. Iniitally there has be a goal for what is available at the time of the Windows 8 launch in five weeks, including a “Windows 8″ (formerly Metro) interface to Skype. But full integration with all the products will require time beyond that launch date, incorporating user experience feedback. Final comment: there were a couple of other new features, not related to account linkage, introduced into Skype 5.11 for Windows – beta and Skype 5.11 for Mac – beta; these will be discussed in separate posts.